The 82nd Airborne Division is a very active infantry division in the US army. Their specialty is undertaking parachute assault operations in areas of combat. The division is based in Fort Bragg, North Carolina. After the Vietnam war the division was deployed in Vietnam and South Korea. The idea behind this was for to get vital experience in potential future battlegrounds. This division was first constituted and organized in August 1917 at Camp Gordon in Georgia. This unit is popularly known as (All-American) because the members come from all the 48 states. This is the reason why their combat service identification badge or shoulder patch bears the letters AA. Their emblem has ( AIRBORNE) inscribed at the top in white with a blue and red background color to signify the American flag. This busy division has been actively deployed in times of war and disasters. In September 2004, the unit was deployed in Afghanistan to support free elections. The division was sent to Iraq in December 2004 to secure the country for the first free national elections. In September 2005, the 82nd Airborne division was deployed in New Orleans for security, search and rescue operations after Hurricane Katrina hit. After the 2010 earthquake in Haiti, the division was deployed to provide relief assistance. The division went through major reorganization in 2006. Instead of being a division based organization, it was transformed into a brigade combat team. In January 2007, a unit was deployed in Iraq to assist in operations there. Deployments to Iraq and Afghanistan were costly in terms of lives lost. Hundred’s of paratroops lost their lives. The 82nd Airborne division left Iraq in 2011. This division continues to serve in other areas that need protection. They achieve this with boldness and utmost dedication. 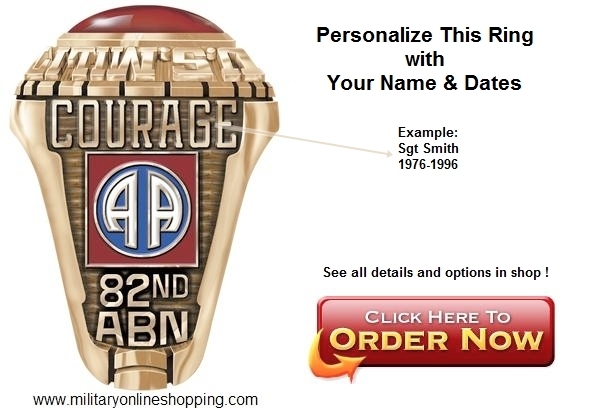 A fine selection of custom military airborne rings are designed for all airborne divisions.